The NRC regulates three operating nuclear power plants owned by the Tennessee Valley Authority (TVA): Browns Ferry, near Athens, Ala.; Sequoyah, in Soddy-Daisy, Tenn., and Watts Bar, near Spring City, Tenn. In a recent letter to the NRC, TVA — the nation’s largest public power company — indicated it may want to build small modular reactor modules at its Clinch River Site in Roane County, Tenn. This would be the first application received by the NRC for a small modular reactor. Small modular reactors differ from the 104 nuclear power plants currently licensed by the NRC in that they have a lower electrical output, are manufactured elsewhere and brought to a site instead of being constructed on site. The small modular reactor design that TVA is considering would be an integral pressurized-water reactor designed by the Babcock & Wilcox Company called mPowerTM. The mPower reactor has an electrical output of 125 megawatts as opposed to approximately 1000 megawatts for the currently operating reactors. The lower electrical output of these small modular reactors make them a better fit for some applications such as the Clinch River Site. One of the primary customers for the electricity generated by these reactors will be the Oak Ridge National Laboratory which is adjacent to the Clinch River Site. They have a need for green power that is significantly less than 1000 megawatts. TVA has informed the NRC that they may eventually build up to six reactors on this site. The modular nature of the designs allows a utility to easily add additional reactors to a site should electricity demand increase. In addition, since the reactors will be manufactured in a factory, the vendors claim that the cost and quality of construction will be better than other reactor designs. They also claim that key design features of the integral pressurized water reactor design make them potentially safer than currently operating reactors. TVA proposes using the NRC’s “two-step licensing process” for an initial group of module reactors, and the combined licensing process for future modular reactors at the Clinch River site. For more information on new reactors and the processes, please click on the agency’s public web site at: http://www.nrc.gov/reactors/new-reactors.html. TVA said it plans to submit its application to the NRC in 2012. We expect our review for the construction permit to take about 2 ½ years. The NRC expects to continue discussions with TVA to identify and resolve potential licensing issues within the coming months. In addition, the NRC will continue meeting with B&W to review the technical adequacy of the mPower design. If the NRC determines that TVA has provided sufficient information, it will issue a construction permit that would allow TVA to begin construction of the first reactor at the Clinch River site. The NRC would not allow TVA to operate the reactor until a determination is made that it has been constructed properly and meet all of the appropriate safety, security, and environmental requirements. Since the mPower design is a new one, TVA and B&W must work together to demonstrate to the NRC that all of the new features of the design meet our requirements. 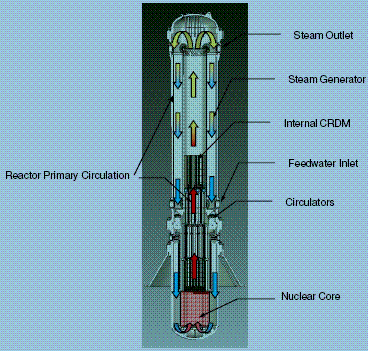 For more information on this design, go here: http://www.nrc.gov/reactors/advanced/mpower.html. I hope NRC is staffing up and getting the technical expertise to expeditiously license these units. I worry about the two-step licensing process being an opportunity for mischievous interveners to stall, obfuscate, and fear-monger the process, as is their stock-in-trade. It would be nice to see the Clinch River site put to some good innovative use to make up for the mistaken and politically-driven dismantling of the breeder reactor project twenty years ago.